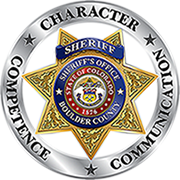 The Emergency Services Group of the Boulder County Sheriff’s Office represents the statutory responsibilities of the Boulder County Sheriff in search and rescue, wildland fire suppression, hazardous materials incidents, structure fire investigations, natural disasters and is a liaison to the other emergency service providers in Boulder County. Emergency Services also provides Seasonal Information, from Christmas lighting to tubing bans, to help keep you safe, as well as information, links, resources, and training for local agencies and personnel. email with any questions or comments about Emergency Services.